A Nod..err..Tilt of Approval for Windows Mobile? I survived! Don't get me wrong, it wasn't easy, but I did manage to get through Week # 1 of the Smartphone Round Robin with my sanity mainly in check. I followed the Round Robin's rules and reluctantly put aside my BlackBerry Curve in favor of the AT&T Tilt (made by HTC). While I initially wanted to throw this Windows Mobile powered device out the Window, by the time I dropped it into a Fedex envelope to head to Mike at PhoneDifferent.com (the Tilt's user for Week # 2 of the Round Robin) I had come to develop a fondness…no that's the wrong word, let's say understanding and respect for the Windows Mobile 6 platform. And that is a long way for this BlackBerry user to come – especially if you take a read through my behemoth AT&T Tilt First Impressions article I posted after only using the Tilt for a couple of days (where I basically rip the device and WM 6 apart). Read On for my Final Take! Of the four platforms being compared in the Round Robin (BlackBerry, Apple, Palm, and Windows Mobile), Windows Mobile is the black sheep of the family in the sense that it is the only one that doesn't manufacuturer its own device. Instead, several manufacturers currently build smartphones in varying form factors to run on the WM operating system. Depending on your take, maybe Microsoft is actually the white sheep in the family while the rest are black - it does makes for a great variety of smartphones! Conversely, with BlackBerry, Palm and especially Apple (who is currently taking the original Henry Ford "Whatever color you want, as long as it is black" approach to its device offering), the manufacturer currently only builds devices for their platform. Regardless of the specific device model within a manufacturer's family of phones, the overall user experience is very much the same within the platform (even when the form factors may vary). Because the manufacturer is building the devices for its own OS, there is a guaranteed level of quality control over the ultimate end-user experience. Coming from the BlackBerry world this holds true – even though the form factor has changed from the 7200s to 8700s to 8800s and Curve (even throw in the vastly different Pearl with SureType keyboard), once you have gotten to know any of these devices you basically know them all – within an hour of using another BlackBerry model you can become equally adept at using another. Seeing a BlackBerry Icon on the Tilt Helped me Survive the Withdrawal! With the AT&T/HTC Tilt, I think the situation arises where because the device manufacturer differs from the OS developer there are some areas/details left untouched which do not create the most user-friendly experience out of the box. While the Tilt's user experience is ok, it could be much better. I know part of my gripe is in the Tilt's 'slider' form factor, which I am openly not a fan of, but not all of it – I think if RIM was to make a BlackBerry with the same form-factor premise as the Tilt, the final package that hits the market would be wayyy more polished and user-friendly, simply because RIM would build the device from the ground up with the ultimate end-user experience in mind. This varies a lot from HTC building the device with a specific concept in mind and then having to fit the operating system as best as they can to work with their device design. Even though I'm sure the phone is designed from the ground up for Windows Mobile, I still think it's just not quite the as good as if the OS and Manufacturer were one and the same. Overall, I am really impressed with the device itself. HTC's build quality is really superb. Yes, the Tilt is a brick, but it's a well built brick and the amount of components and functionality they crammed into the device – GPS, WiFi, 3G, Touchscreen – is impressive. Where the Tilt and I have not been able to get along is in the form-factor department. After a week of use I simply could not come to terms with all of the input methods the device offers. 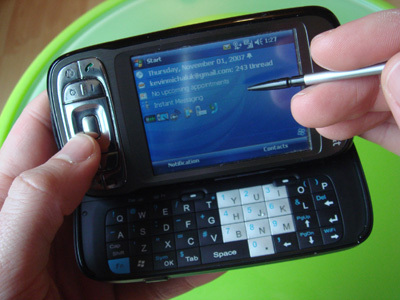 Between the touchscreen and stylus and multi-control navigation and shortcut buttons and full keyboard and trackwheel and soft buttons (on the front and on the keyboard) there was just too much going on to ever develop a habit of how to use the thing. As a result, I never did become comfortable with the phone – reaching for it and using it tended to cause more aggravation than it was worth. With so many controls I often accidentally hit buttons and did things I was not trying to do, and I continue to dislike the fact the Tilt very much requires two hands to operate. In my initial impressions article, I laid a lot of blame on the Windows Mobile OS itself. Re-reading that article before writing this one, I can see now that a lot of the frustration was a result of my usability issues with the Tilt's design. I received a ton of feedback from Windows Mobile users suggesting that using a Windows Mobile device with a form factor more akin to the BlackBerry's would probably be better suited to me and change my opinions of it. I'm betting they are definitely right and that next year when it comes time for the Second Annual Smartphone Round Robin the Windows Mobile device we choose will more closely resemble a BlackBerry, iPhone, or Palm device (assuming Palm is still around – ooohhh snap!). 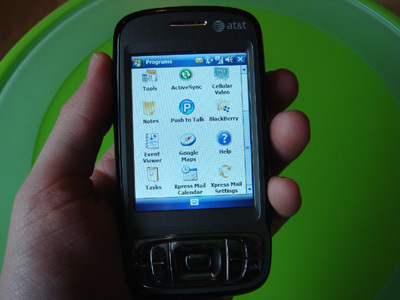 From an end-user perspective, the Windows Mobile platform can do pretty much anything the BlackBerry OS can and more. What it does the same, it does slower than on a BlackBerry, but I can't really knock it for what it does above and beyond the BlackBerry (even if it's slow too). Panaroma Mode on the Camera is Really Cool. You snap 3 pictures in succession and tie them into one wide one! When I read other literature about the Tilt and Windows Mobile, I often hear that it is suited for "Business Power Users". I find this term sort of funny, because every "Powerful Business Man/Woman" I know of uses a BlackBerry and not a Windows Mobile Device. Here's where I draw the distinction – people who use BlackBerrys don't want to spend all of their time on their smartphone. They want to grab it, do what they have to do, and then put it away so they can get back to work or play (that's the design philosophy that made RIM a success in the business executive circle). It's a communication tool that offers more. Windows mobile phones require more face-to-face time at each use, which is annoying when compared to the BlackBerry as a communication tool but is fine when considering a well-hacked/software loaded WM phone can all but eliminate a laptop for the business road/air warrior. The CEO of a Fortune 500 Company might hate a Windows Mobile phone, but there's a good chance that same company's Sales Force would appreciate it. As for the personal consumer, it all depends on how the device will be used. I'd take the BlackBerry. Over the course of the week, I got to know the Windows Mobile OS well. Once I knew where everything was I managed to cope ok with the Tilt despite my form factor usability issues. Help in the comments and forums resolved my biggest gripes (I performed a "hack" to get the LED lights to turn off on the Tilt and found the setting so any button powers the device on – though it's not a great setting as pressing a button also executes the command…it should be any button to power on, another click to execute). 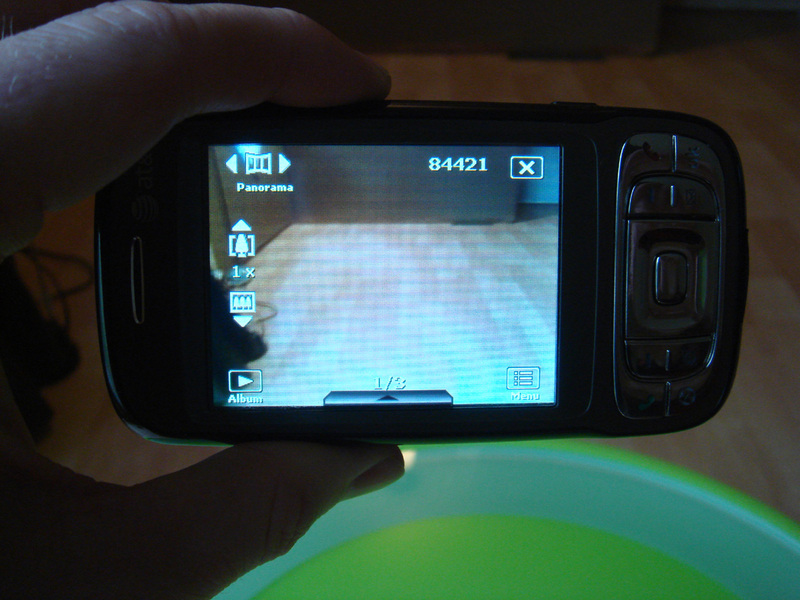 The out-of-the-box experience isn't great, but with enough effort you can "hack" Windows Mobile to be quite usable. Unfortunately, though I came to understand and respect the Windows Mobile platform, my final conclusion is that it's not a good operating system for the hardware available today. 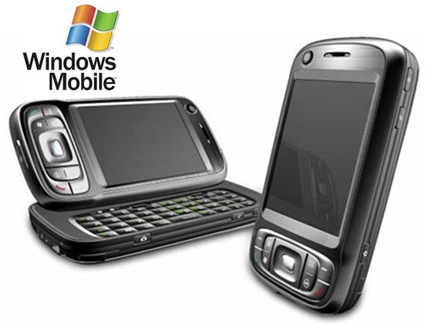 The Tilt is a cutting edge device, yet running Windows Mobile it is unbearably slow and a fully-charged battery never lasted more than 18 hours while I had it in my possession. Windows Mobile is a beast of an OS, and therefore needs a lot of MHz (and therefore a lot of battery juice) to get the job done. Functionality is only good if the device functions, and on that front I still think there is a lot of work to be done before you see too many BlackBerry users wanting to trade in their device for a WM-powered one (and without two-way BlackBerry Messenger on Windows Mobile it will never happen!). The one thing I do know is that Microsoft won't stop, and once the hardware catches up to their software, with the foothold Microsoft has in the corporate world and their announcement of Mobile Device Manager 2008, RIM is going to be knocking gloves with a monster in the years ahead. It'll be a fun battle to watch and one that will only benefit the end-user down the road. In general, these smartphone devices rock…and they are only going to get BETTER. Pretty soon there will be no sacrifice between email/media player/battery life/usability. 2. Editors must attempt to sync their phone to their computer, syncing all PIM data: ActiveSync was easy to use. Made me wonder why the BlackBerry Desktop Manager is such a huge file to download and install compared to ActiveSync. 3. Editors must attempt to set up their email on the smartphone: Easy, thanks to BlackBerry Connect. I never tried otherwise, so we'll see how Mike over at PhoneDifferent.com copes with it this week. 4. Editors must attempt to use their smartphone to get directions at least once: Easy. I love the Tilt's GPS. Fast and accurate. 5. Editors must attempt to use their smartphone with a bluetooth headset: Easy. The Add Bluetooth setup is a bit more buried than on the BlackBerry, but an easy process all the same. 6. Editors must attempt to install at least 2 3rd-party apps (if possible) on their smartphone: Google Maps, BlackBerry Connect, Windows Live Search, and some Games. 7. Editors must attempt to play a game: BubbleBreaker is nearly as addictive as BrickBreaker, but not quite. 8. Editors must attempt to browse the internet: Good browser. Was nice and fast thanks to my WiFi connection. I am excited to try the iPhone's browser and see how that compares to WM and BlackBerry. 9. Editors must attempt to add music to their smartphone and use it as their music device: Easy Peasy. 10. Editors must attempt to watch a video on their device: Also Easy Peasy. 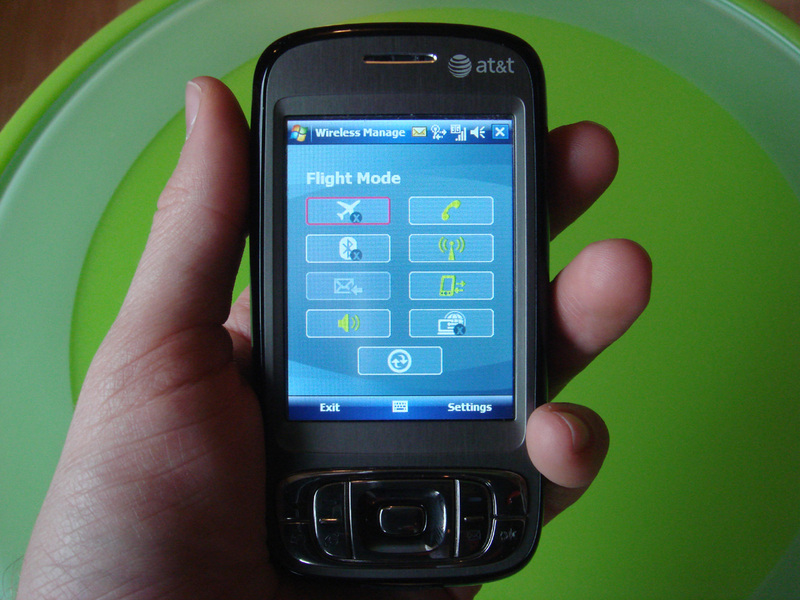 All in all, the AT&T Tilt with Windows Mobile 6 got the job done. Up Next - Good Bye Tilt, Hello Treo 680! Mike now has his hands on the AT&T Tilt, and I have my hands on the Palm Treo 680. First impression – I think it might be tougher to get through this week than last week. Stay Tuned!